No-one likes a junk Audi, so if you have one in your possession, the likelihood is that you will want it gone from your life. Otherwise, it is just a very large piece of useless scrap metal sitting on your lawn. However, it makes no sense that anyone would want to take it off your hands. They have as much need for a clunker as you do! So how are you supposed to get rid of it? Your best bet is to call Wreck Monster. 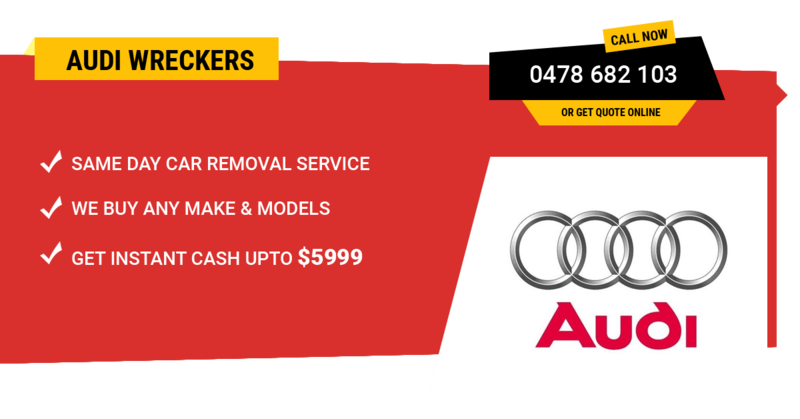 Our Audi Wreckers Sydney crew won’t only just take that Audi off your hands. We will pay you good money for it too! If your Audi is not a junk car, but you want to sell it fast for another reason, we provide the quickest method for selling cars in town. So whether you are selling a junk Audi or a used Audi, call us at 0478 682 103 or fill out the form on our website! Audi is one of the most frequent models that we buy every day. The dismantling process happens and parts go on sale daily. Feel free to inquire spare parts for any Audi model and we will try to fetch them out of the inventory for you. Our prices are affordable & quality is high. You might get the limited warranty on selected parts as well. You can also book the free face to face consultation with our Audi parts experts to make sure that you are buying the right part for your machine. There may be some concern that we won’t buy your Audi if it is in an extremely bad level of disrepair or damage. However, we buy junk cars of all types. It doesn’t matter if your Audi has been in a severe crash, flood, fire or it is simply incredibly old. We don’t reject vehicles at all. We will always look at each vehicle individually and pay top dollar! Q2 we will buy it! Making sure that we are the number one auto wreckers of Audi cars involves ensuring that our customers get the best deals. If you get the most money possible you will be more likely to spread the news and be a repeat customer. That is why we include no hidden charges or fees, so that nothing undercuts your cash payment. This pertains especially to our car removal services. We will perform it for you free of charge. We use our top of the line removal equipment so that the whole process is as smooth and convenient for you as possible. We buy cars, dismantle them, dispose them and recycle the metal in Eco- friendly way. Recycling is vital or we are going to harm our nature. Please support us by getting rid of all the unwanted Audi or any European models that we can buy for the good cash. Feel free to Contact us today. We give out free quotes. Call us or fill out the form on our website. Be sure that you tell us what model Audi you are selling, as well as how old it is. We will also need to know what condition it is in. That will help us to furnish you with the most accurate price that we can possibly give you. Waste no time and drop us a line today!